The curious phenomenon of “things that look like Hitler” encompasses everything from houses to horses, allowing one of history's greatest villains to live on - in pop culture that is. Do these 8 creatures really display a definite resemblance to the nasty Nazi, or are we all just seeing faces in clouds? Is your kitten a Kitler incognito, or even full-on cognito? 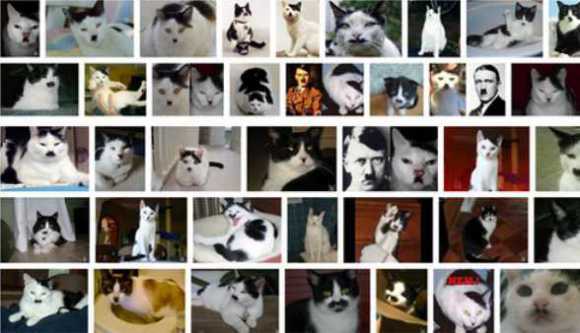 So-called “Hitler Cats” seem to be everywhere; there's even a Cats That Look Like Hitler website that features over 7,500 images of the toothbrush-mustached, slant-forelocked beasts. Seventy-odd years too late, the Kriegsmarine's finally found a foil for The Incredible Mr. Limpet. 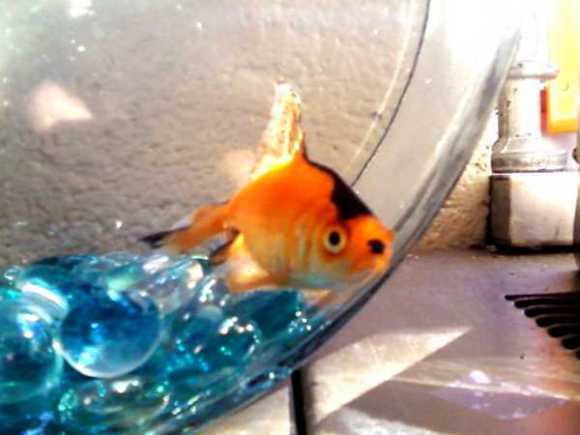 No, it's not adolphin but orange you glad it's a goldfish? “Adolfish the goldfish” rose to fame from humble origins: four-year-old Ellena Schatynski of Stockport, Greater Manchester, UK won the furless fuhrer fish at a local fair. Her family only noticed the fish's startling resemblance to Hitler once they got home, popped him in a fishbowl, and took a good hard look. Wouldn't “Hitler Stinkbug” be a great band name? Well, maybe not and the actual insect pictured above isn't named that either, regardless of the eerie Hitlerian face peering out from its folded wing covers. 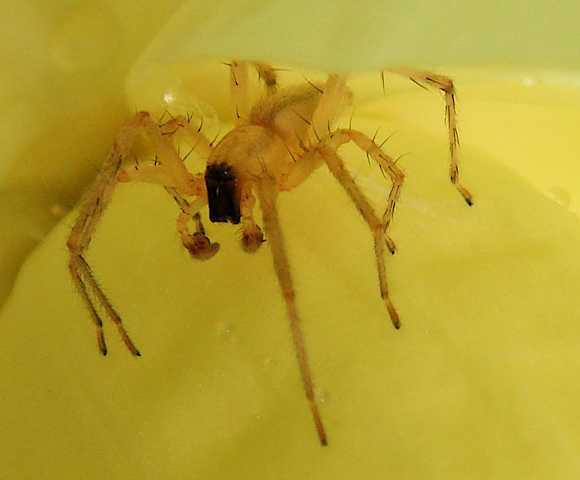 Biologists state that many insects use unusual color patterns to fool potential predators into thinking they're frightening and dangerous... and you, Hitler Stinkbug, win the prize. They say Hitler “wasn't that bad” because he liked dogs, but did Hitler like just any dog or only dogs that looked like Hitler? On the other hand, did dogs respond to His Master's Voice or to the self-styled leader of the master race? On the third hand, did field marshals who performed poorly in the field find themselves in Hitler's doghouse? The surprised-looking stray above might have posed quite a quandary for Der Fuhrer. Suffice to say this is one pooch who'd best consult a psychiatrist ASAP before it goes to war with itself. A horse is a horse, of course, of course, and no one can talk to a horse of course, that is, of course, unless the horse is the famous Mister Edolf! Sure you want to saddle up the author of Mane Kampf? If so, be prepared to spur him on to victory at all costs and keep in mind, retreat is not an option. This particular alps-aloosa doesn't respond well to the whip – at least, not in public – and he's been known to champ at the bit when putsch comes to shove. Look he's crawling up my wall, black and hairy very small, now he's up above my head, hanging by a little thread: Hitler the spider! It's enough to give any fan of The Who a case of adolfophobia, and believe me there's a LOT of other things I'd much prefer a case of... like beer and the plague, to name just a couple. Y'know what really gets my goat? 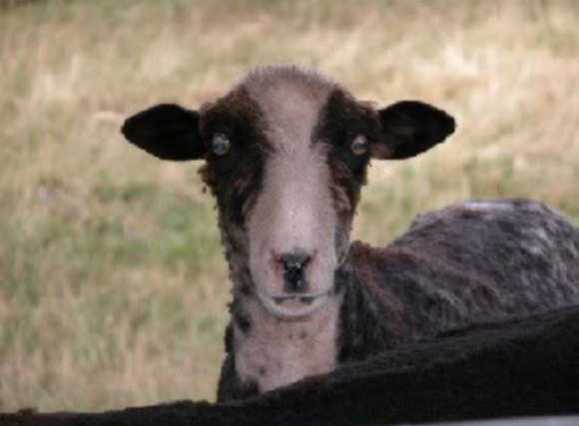 Hitler Goat! There's nothing capri-corny about a grass-grazing goose-stepper with a baaad attitude. Then again, goats are herbivores and Hitler was said to be a vegetarian so he's got that goin' for him, which is nice. Our Hitler Goat of choice is the blazing-eyed “kid” above. See him stare intently into the camera with blinding blinkers even the Hypnotoad would envy. Observe his smooth head uncluttered by protuberances of any type – he's not your average horny old goat! Worried you're seeing Hitler in every cat, dog, house or lotion bottle? Worried I'M seeing Hitler in every cat, dog, house or lotion bottle?? Could Churchill's much-maligned Bohemian Corporal just be laying low, marking time, pining for his roost in the Bavarian Alps? Relax, everyone. To paraphrase Monty Python, 'E's not pinin'! 'E's passed on! This despot is no more! He has ceased to be! 'E's expired and gone to meet 'is maker! 'E's a stiff! Bereft of life, 'e rests in peace! 'Is metabolic processes are now 'istory! 'E's off the twig! 'E's kicked the bucket, 'e's shuffled off 'is mortal coil, run down the curtain and joined the bleedin' choir invisibile!! THIS IS AN EX-PARIAH!! Whew, that's a relief, and for those who believe in karma, at least take some comfort knowing the infamous author, painter and would-be world dominator was reborn as a stinkbug.